We all know that how annoying all those USB power chargers are on your desk but now there is a desk charger that looks amazing in your desk. 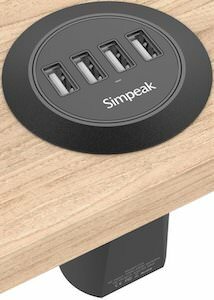 This is a 4 USB port desk charger that fits in a round hole in your desk. You can make a hole in your desk or use one you already have for cable management. The desk charger fits in a 50 and 60 mm hole (holders included) and when you do you will see 4 USB connectors on top of your desk. The USB charger can give up to 2.4A to each port and the desk charger can give up to 6A and 30 watt. 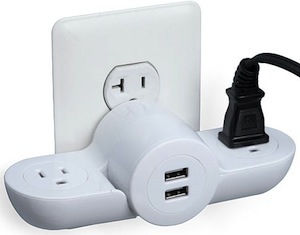 The USB desk charger just plugs in from the bottom and can be used between 100 and 240 volt so that it can be used in many places around the world (US power cable included). So clean up your desk by adding this 4 USB port desk charger. 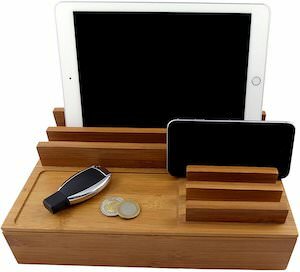 We all have devices that need charging and the often are just cluttering all over the house but now there is this nice wooden charging station. The charging station is a wooden box where your wires hide in and then on the wooden top you have room for you devices that can stand in the edges so that it all look great and is out of the way. And the charging station has a 60Watt 6 port usb hub from RAVPower so that you can charge 6 devices at once without having to need 6 wall chargers. You know that this will look great in your home so don’t wait come get your Wooden Charging Station. We all know the problem you have a phone, tablet and laptop that needs to be charged but your hotel room only has one socket for you. But we have found the solution. The Pivot Power Mini Wall Plug / USB Combo can be folded down for easy storage and folded out it offers 2 USB ports and two 3 prong power plugs. 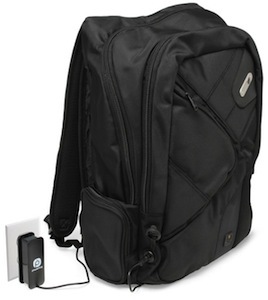 You can’t tell me that this is not a handy device for at home, the office and of course on a trip. So solve you power needs with the Pivot Power Mini Wall Plug / USB Combo. 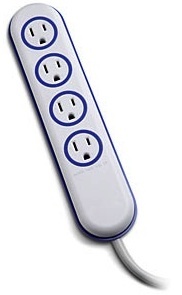 Yes this looks like any other power strip but you may be fooled. This power bar is so much more just like any extension cord it will let you connect up to 4 devices to the strip and it does pretty much anything a normal power strip would do. But this one is also water resistant so don’t worry if you empty a glass of water on it. And how about kids they like to put stuff in those power strips. Don’t worry nothing will happen if they put the scissors or even there tongue in the wholes. It will only conduct electricity when a proper plug is 100% inserted. There is even a protection for over heating so with this power strip your life becomes a lot safer. And besides that all the lifespan of this extension cord is 4 times longer then a normal power strip so it will last you a long long time. Wait no longer go order a Safety Power Strip. OK so you are on the road and then your iPad runs out of power. I know it is hard to believe but it could happen. Hmmm no power socket, no problem. 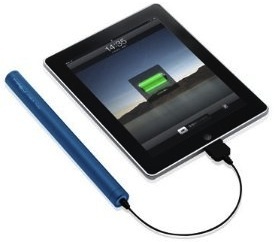 This external battery gives you 6600 mAh power enough to charge you iPad, iPhone or iPod. But not only Apple devices no the battery includes 10 different tips so that you can charge most phones or tablet computers. Go check out this GSI 6000 mAh External Battery. We all do it charge our phones, mp3 players and laptops way longer then needed and the result is that we waste a lot of power and our batteries are getting worse and worse. 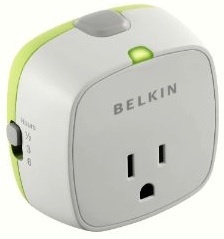 Now Belkin offers this little Conserve socket that you can put between your device and the wall socket. You can select a time of 30 minutes, 3 or 6 hours and after that it will cut the power. And ok maybe your iPhone is empty at the end of the day but it will be charge in 3 hours. With this little helper you will save on your electricity bill and on the live of you device. So check out the Belkin Conserve Socket. No doubt about it this baby is ugly. This Monstrous iPhone Battery is ugly but it offers 3000mAh of power and that means 8.5 hours of talking time or 40 hours of music and what about 11 hours of video. I guess you get the picture this battery will give you power on the go when ever you need it. 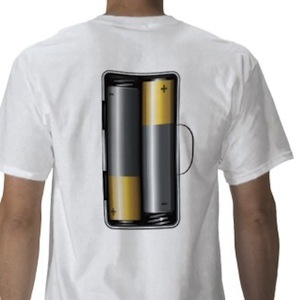 Didn’t get my iPhone to run out of power yet but I know of people out there that really need this battery to keep them going through the day. We all are in problems when the power go’s down. Lucky for me I normally work on a laptop so my battery will take over before my machine dies. But there are things around me that still need some fresh power while I am working. For instance my external hard disk that I use to make my backups on still needs power to work. 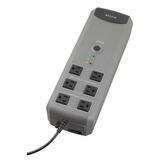 And that is why this UPS from Belkin will be the saver of your day when power go’s down. OK maybe you can’t keep working but at least it gives you enough time to save what you are doing. Go check out the Belkin Home Office 375VA UPS and enjoy the next power outage!